Learning content is often being generated in a more decentralized manner by the employees. I have been referring to this concept as Employee Generated Learning. This post investigates the effect on the role of the instructional designer in that light. The e-Learning landscape is fundamentally changing. A while ago I published a blog post about this change. In this blog post, I elaborated on how this transformation boils down to a shift away from content creation by instructional designers. Instead, learning content is often being generated in a more decentralized manner by the employees. I have been referring to this concept as Employee Generated Learning. Today’s post is the first of three blog posts on these sub-topics. Today I will focus on what the implications of Employee Generated Learning are for instructional designers (people who specialize in e-Learning creation). Traditionally, instructional designers are responsible for the creation of learning content. The shift towards Employee Generated Learning will result in a transcending role for instructional designers. What I mean by this, is that their role will be less about the creation of the actual content itself and more about the facilitation of content creation by subject matter experts within the organization. 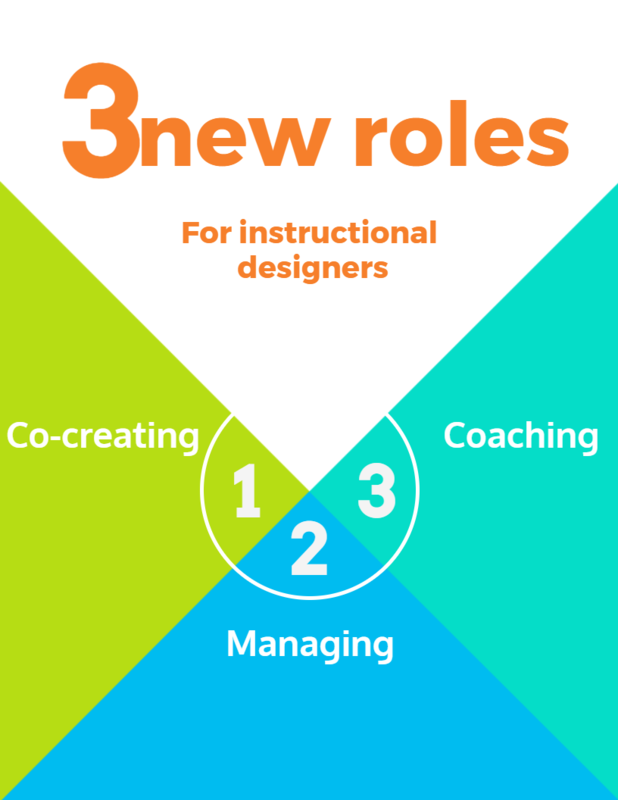 As shown in the figure below, the role of the instructional designers will encompass three primary tasks: co-creating, coaching, and managing. It is a shame if the course creation expertise of instructional designers is not utilized. Therefore, ithere remains a co-creation role for instructional designers. This is the first new role the instructional designer will embody within Employee Generated Learning. Rather than focusing on the creation of content, it will be necessary for instructional designers to concentrate on the structural elements. Addressing these elements can be done by setting up learning goals and the course structure. Additionally, more formal and technical creation parts should involve the instructional designers, as that is where their expertise resides. The second key role of the instructional designer is to ensure the quality of courses created. The focal point here is not in quality assurance on a content level, but rather on a didactical level. The instructional designer’s strength lies in the deep understanding of how to transfer knowledge effectively. Therefore, it is only natural that they will edit, both during and after the creation of the course. This is needed to ensure there is correct didactical alignment within the learning material. There is a third role which instructional designers should take on. Namely a coaching role. The primary aspect of this role is overseeing and guiding the course creators (employees/subject matter experts) regarding appropriate course creation. This should be done throughout the creation process, both before, as well as during, the formulation of the course. In this respect, the instructional designer ideally fulfills the role of facilitator rather than the role of content creator. Guiding and coaching the subject matter experts leads to more effective and didactically sound learning material. We at Easygenerator believe that Employee Generated Learning is the way forward. Therefore, we have ensured our authoring tool is well-suited to empower employees to generate their learning. I believe that there are a few indispensable elements a tool must have to enable Employee Generated Learning. First and foremost, it is of importance that the authoring tool has no learning curve. In other words, your learners need an intuitive platform for developing and deploying content. E-Learning software for non-experts needs to be easy and intuitive to use. Secondly, and closely related to the ease of use, is the need for templates and the possibility to reuse content. 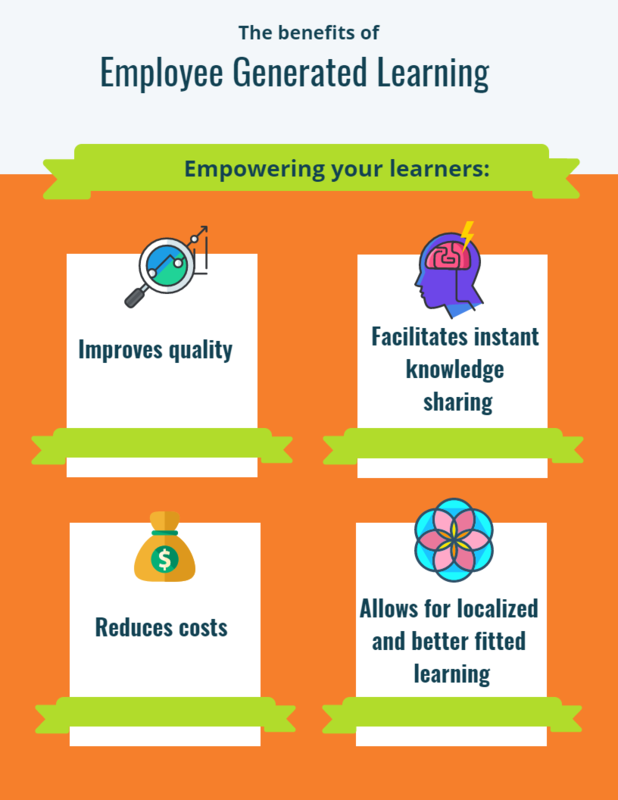 These elements help to empower your employees in generating learning content without them having expertise in e-Learning creation. With that, I’ve concluded today’s post. My next post will continue to assess the implications of Employee Generated Learning as I dive into the changing role of the learning department. Previous What are your biggest Learning and Development challenges? Blog at Powered by WordPress.com.